This sermon was preached on June 23, 2013 at Winnetka Presbyterian Church in Winnetka, IL as I candidated to be their new Associate Pastor. My two texts were 1 Kings 19:9-18 and Luke 8:26-39. You can hear the sermon below. Now, I know that for many of you, this passage in 1 Kings is probably quite familiar. Many of you have heard about the “still small voice of God” and its origins are here in this passage. But I think there is so much more to this passage as well. Here we see Elijah on the run…fearing for his safety. Just a chapter earlier, Elijah had participated in a “battle of the Gods,” a match between him and the prophets of Baal…a contest to see who was the one true God…as you may recall, the prophets of Baal didn’t have any luck getting their sacrificed bull to catch on fire. They cried out to Baal from morning to the evening…and no response. And that’s when Elijah killed the prophets of Baal….all 450 of them. First there was a great wind. A wind so strong it was breaking rocks in pieces and splitting mountains. And yet, with all of that strength, with all of that power, with all of that ability to change the landscape…God was not in the wind. And then there was an earthquake. As if splitting mountains and flying rock pieces wasn’t enough, now Elijah is standing on a mountain…in an earthquake. And yet, with all of the earth-moving vibrations, with all of the shaking, rattling and rolling…God was not in the earthquake. After the earthquake, there was a fire. Now, fire has certainly signified the presence of God before; we think of the burning bush that Moses encountered and the pillar of fire that led God’s people out into the wilderness…and yet, with all of that history, and with all of that light and warmth…God was not in the fire. The sound of sheer silence. And we are told that Elijah heard this silence, wrapped his face in his mantle and then went to the entrance of the cave. Now, the text doesn’t read: “When Elijah heard it…he knew God was in the silence…” but the implication is there – that something holy has happened. And so in the hushed stillness. In the silence. In the sound. Thin. Quiet……God showed up. Now let’s leave Mount Horeb in the Sinai desert, and go up to the Gerasenes’ land, across the lake from Galilee, in what would be modern day Jerash, in Jordan. Our scene from today’s Gospel reading was anything but quiet, still and silent. Here we have Jesus’ encounter with the Gerasene demoniac, a man who is, according to the gospels, believed to be possessed by a demon, and essentially, our story is about Jesus performing an exorcism. And before the demon-possessed man has even had the chance to address Jesus, the text tells us that Jesus had already commanded the demon to come out of the man. Now, we soon find out that it isn’t just one demon possessing this Gerasene man, but rather a Legion of demons. There are a legion of forces distracting this man, pulling him in different directions, commanding his attention and causing him to lose control of himself, his body, his mind and his entire life. While we might not use the same language and name them as demons…haven’t we all felt, from time to time, that there are forces in our world, in our lives, that distract us, that pull us in different directions, that command our attention…that cause us to feel like we’re losing control of our lives…? Maybe we too sometimes feel like we are going a bit crazy and we also want to be able to run up to God and ask for help. And so a very troubled man has an encounter with the Divine, with Jesus the Christ, and his life is changed. Something clearly happened. The Gerasene man met Jesus and in a dramatic moment, one that was most likely filled with loud noises, a jeering crowd, disciples who were trying to keep order, and overall mass chaos…in that moment, which was anything but silent or still or quiet…God showed up. God shows up in the chaos. 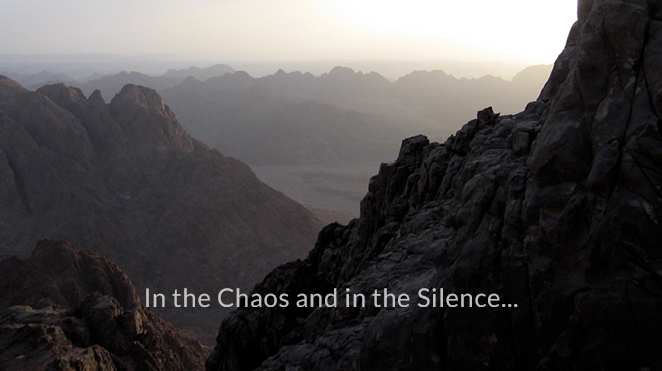 God shows up in the silence. And as I spent time with these two texts over the past few weeks, that’s been what has stood out to me the most. In these two stories, in different geographic places, in different eras in history, in different manifestations, the same God shows up, makes Godself known, and changes people’s lives. Maybe it was the birth of a child, or the time you saw the most exquisite sunset, or rainbow, or waterfall, and just knew that God had to have been involved in that. Or maybe it was the moment your father or mother passed away, and as you experienced a deep sadness, there was also a clear presence of the Holy. Maybe it was just a conversation with a close friend? Or the simple reminder that God was present with you as you sat in traffic on Willow Rd…? Or the way you felt when the Blackhawks won game 5 last night WITHOUT having to go into Overtime? My wife, Sarah, is a spiritual director, and if you want to know more about that ministry, you should check in with her. And I meet with a spiritual director once a month…but essentially, spiritual direction, for me, is having someone help me to become more aware of the times and places and ways in which God shows up in my life. And through those conversations, I’m able to become more and more aware of where God is at work in my life, and in the world. And I think that’s really one of the goals of being a follower in the way of Jesus – the goal is to always become more and more aware, and be on the lookout for God. And that is one of the things I’ve loved learning about all of you here at Winnetka Presbyterian Church. I think you’ve been doing this very thing. You’ve been on the lookout for where God is at work…whether that’s in the Ukraine, in educational opportunities throughout the year, in small groups, in the work that you do with Family Promise and A Just Harvest, or with your ministry at the Jonquil Hotel…you have proven, time and time again, that you are a community that is looking for those places where God shows up. And I’m excited about the opportunity to walk alongside you all as we explore where God might be calling us in the future to be on the lookout for God…because it’s possible that we will find God showing up in some surprising places. And I don’t know about you – but I need that reminder sometimes. I need to hear these passages of people’s stories intersecting with God’s story, and the radical transformation that can come out of those experiences. But I need to not only to hear those stories, I need to be reminded to share those stories. At the end of our passage from Luke, the man whose life had been forever changed by Jesus, pleaded with Jesus to let him go along, to be with him. And who can argue with that? He had just been given a new life by Jesus, of course he would want to follow him and remain close to him. But what does Jesus tell him? When we have these experiences of God showing up, when we encounter the Divine in a way that changes and shapes who we are, we can’t just keep that to ourselves. We shouldn’t want to! Now, Presbyterians don’t generally like to talk about the “E-word” – you all know which word that is right? Our passages today give us a reminder of the diverse and varied ways in which God has shown up in the Bible, and I think, they encourage us to always be aware of how God continues to show up in our world today, in ways that make sense to us, and in ways that surprise and confound us.